Today’s reading reminded me of my own journey of faith which began almost exactly 32 years ago this month (July 24th marks 32 years). I was only 17 years old back then, and I was doing my own thing, imagining my own future based on my own interests, and dreaming my own dreams about what I would do with my life. Then Jesus came along and said, “Follow me,” and the rest is, as they say, history! For the past 32 years, I have been on what has become a life-long journey to leave my own pursuits behind in order to do what Jesus wants me to do. I have not become the person I imagined I would be back when I was 17 years old. But I am becoming, I believe, the person that I was born to be. But Jesus didn’t just call me into a personal relationship with him. No. He also called me to join him in the work of bringing other people into his growing family. Over the past 32 years, I can tell you that I have met people who have joyfully responded to this invitation, and people who closed their hearts to it. The reading today is paired in the Lectionary with Amos 7:12-15, Psalm 85:9-13, and Eph. 1:3-14. 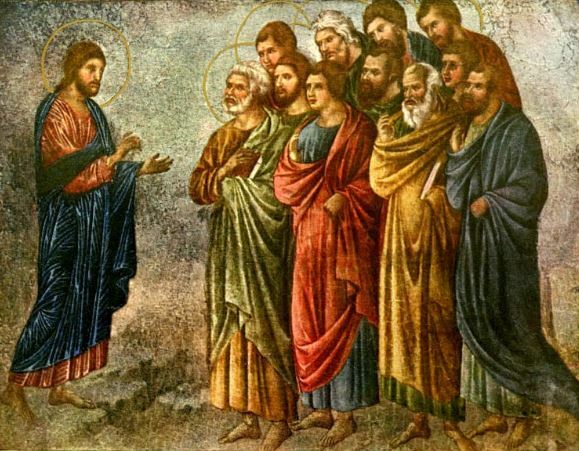 If we read them closely and carefully, we’ll see a common thematic thread that I believe connects to what I have just shared about my own journey with Jesus. See if you can detect it as well. I get the idea that Amos isn’t trying to fit in with Amaziah’s conventional view of prophets. He’s just doing what God called him to do despite the resistance he’s feeling from outside (and perhaps despite the unfamiliarity that he may be feeling with the task on the inside). How will these people receive these good promises from God? I get the idea that the Psalmist is trying to get everyone ready for a visitor with a message that, if they open their hearts to it, will usher in all of the things he has promised. Their open-hearted and welcoming response to the one who “goes before him and prepares the way for his steps” will be the key! One thing seems certain in all of these texts; this is no monergistic enterprise! God truly initiates His good work in the lives of people, but if they won’t respond with faith (and faithfulness), they will not realize all that God has in store for those who love him. That brings us to the Gospel reading today in Mark 6:7-13. Like Amos, these men where not “professional prophets.” They were formerly fishermen, tax collectors, and common tradesmen. Whatever they were doing before they met Jesus, they left it behind once he called them to follow him. Exercise authority over impure spirits. Take nothing for the journey buy the bare necessities (trusting God for daily provision). Find a welcoming home to stay in while ministering in a town. Leave any town that will not welcome or listen, and shake the dust off your feet as you leave as a testimony against them. Embedded in their commission were Jesus’ own words of caution; not everyone would welcome the message or the messengers. The message of repentance and their “hands-on” ministry of deliverance from evil spirits and healing of sickness can all be seen as the ministry of preparation for the reign of God. The messengers did not go out in their own names or to exalt themselves as the source of blessing. They went in the name of Jesus, functioning in his authority, and announcing his reign. Therefore, to reject them was to reject Jesus himself. Jesus calls us into his service. When this happens, our lives become reshaped by his priorities for us. Jesus calls us to reach out to others. When we go, we help people work through both waywardness and brokenness in order to make room for the good things that God is bringing to them. Jesus reminds us that not everyone will welcome us (and by extension, they will not welcome him). How wonderful for those who listen. As the Psalmist said – salvation is near them, and glory will dwell in their land. The Lord will indeed give them what is good as they make way for him. And as Paul said to the Ephesians – the full inheritance (and all the guarantees that go along with it) are theirs when they hear and believe. But woe to those who will not listen. This Sunday Gospel Reflection is taken from the daily readings in the Catholic lectionary. It is primarily my own way of reflecting on the Scriptures and preparing my own heart for worship on the Lord’s day. I welcome any feedback or insights you would like to share in the comments below.